What Can I Learn in an Online Master’s in Accounting Program? How Much Can I Make with a Career in Accounting? An online master’s degree in accounting can help students meet a number of career goals, whether they want to work their way up to a Chief Financial Officer or Controller position at a company, begin their own accountancy practice or become a more specialized practitioner like a forensic accountant. Learn about the types of courses students in these programs complete, the skills they gain during their time in school and the best online master’s in accounting programs. Students who enroll in online master’s degree programs in accounting are serious about building strong careers, as well as gaining a deep understanding of a specific area of the field. Prospective accounting graduate students must weigh their options carefully when considering what school to attend. We help you do that with our rankings below, which were created using information provided by schools, the U.S. Department of Education and the Integrated Postsecondary Education Data System (IPEDS). All schools included in this list are fully accredited. Liberty University is one of the largest private, not-for-profit Christian institutions with over 110,000 online and on-campus students. The school's Master of Science in Accounting is available entirely online and will help you to advance into a specialized career in accounting. Students can choose the general track or can specialize in one of 6 concentrations: taxation, business, auditing and financial reporting, financial services, forensic accounting and leadership. Courses are asynchronous, 8 weeks in duration and delivered through the Blackboard system. Online students have access to various student support services, including IT support, writing resources, online course guides, webinars and instructional media tools. Military service members, veterans and military spouses may qualify for an application fee waiver. Military students receive a significant tuition discount, as well as the option to start courses at 8 different times per year with no set login times. Incoming students must have an undergraduate record of foundational business and accounting courses. Any of those prerequisite courses must be completed prior to enrolling in any graduate accounting classes. Incoming and transfer students may receive credit for prior learning or work experience and military service. All appropriate documentation must be submitted to the registrar to be considered for credit. Transfer credits from other regionally accredited schools are also accepted and evaluated on a case-by-case basis. Upon completion of this program, you will be prepared to sit for the Certified Public Accountant exam, provided you have met the other requirements in your state for CPA exam candidates. The online Master of Business Administration with a Specialization in Accounting program at Culver-Stockton College is designed for working professionals and adults to advance their knowledge of the field and increase their earning potential. Distance learners who work full-time will be able to complete their degrees quickly with Culver-Stockton's flexible 8-week, accelerated courses. As an online student, you will be able to work one-on-one with experienced faculty members and academic and career counselors and access Culver-Stockton's library, with fully online bibliographic databases. Throughout this MBA program, you will complete courses in communication and qualitative and quantitative data analysis to further develop your analytical and decision-making skills. Upon graduation, you will be prepared to take on leadership roles in the evolving business world. Incoming students must have completed the requisite undergraduate business courses. Deficiencies in your academic record may be completed through the undergraduate online campus program. Applicants must submit an official GMAT score, with a minimum combination of 200 X GPA plus a GMAT score greater than or equal to 1025. You may be able to obtain a GMAT waiver if you have a high undergraduate GPA and significant work experience in the field. Incoming students can transfer up to 9 credit hours toward the accounting degree as long as those credits were earned within the last 5 years with a "B" or better. You must maintain 3.0 GPA and a "C" average or better in all MBA courses to remain in good standing. All MBA graduate students must complete their degree requirements within 5 years of their start-date. Culver-Stockton College is accredited by the Higher Learning Commission. Saint Leo University is a private, not-for-profit institution affiliated with the Roman Catholic church. You can earn your Master of Accounting degree online and prepare for the Certified Public Accountant and Certified Management Accountant exams. In this 30 credit hour program, you will learn about resolving financial reporting issues for U.S. and multinational businesses. Students also obtain the essential knowledge of tax laws and relevant legal concerns in the field. When you reach graduation, you will be prepared for careers as a CPA, auditor, chief financial officer, IRS investigator, forensic accountant and other accounting positions. Recent Saint Leo accounting graduates have moved on to careers at companies like Price Waterhouse Coopers, Entegra Power Group, the United States Special Operations Command and the Federal Deposit Insurance Corporation. Admissions at Saint Leo are rolling, and you may apply at any time to begin your studies during any of the 6 start-dates throughout the calendar year. The MAcc program requires a minimum GMAT score of 500, completed within the past 5 years. You will also need to submit a resume showing at least 2 years of work experience, an essay, and 2 professional recommendations with your online application. Admitted students with a non-business undergraduate degree may be required to take additional business courses to satisfy requirements for graduation and the CPA exam. Prior learning experience and military service may count toward your degree. You must submit official documentation for each experience for the registrar to evaluate on a case-by-case basis. At New England College, you can pursue the Master of Science in Accounting to expand your knowledge in taxation, financial reporting, cost reporting, auditing, mergers and acquisitions. New England College is accredited by the New England Association on Schools and Colleges (NEASC) through its Commission on Institutions of Higher Education (CIHE). This 40 credit hour program will help you diversify your career options and pursue upper-level careers in auditing and risk management, management, banking and financial services, not-for-profit organizations and taxation. You will also be prepared to take the Certified Public Accountant, Certified Management Accountant or Certified Internal Auditor exams in most states. For those online learners interested in fraud prevention and criminal investigation, you may elect to obtain a concentration in forensic accounting. The forensic concentration prepares you for the Certified Fraud Examiner designation exam. Most full-time students complete their NEC master's degree in less than 2 years. Applications are accepted at any time, as NEC uses a rolling admissions schedule that allows students to enter every 7 weeks throughout the year. For admission to this 100% online program, you do not need to submit GRE or GMAT scores. Online students have access to the same support services as traditional on-campus students, including academic advising, career and life planning, mentoring programs, veteran services and library access. NEC offers active duty service members a highly discounted tuition rate and 10% tuition savings for veterans, Reservists, Guardsmen and their spouses. Up to 8 credits earned from other regionally accredited institutions with a "B" or better may transfer toward a graduate degree at NEC. Mississippi College is a private, Baptist-affiliated institution serving over 5,000 students and is the oldest college in the state. The MC school of business offers a comprehensive Master of Business Administration in Accounting in both fully online and hybrid formats. With a curriculum built on the combination of theory and practice, the program prepares students for a variety of accounting careers in the public or private sector. Graduates of MC's MBA program have gone on to become CEOs, CFOs and executives in fields such as intermediate accounting, federal tax accounting, auditing and cost accounting. The program also prepares students for the CPA exam and other professional certifications. With guidance and instruction from MC's established faculty, distance learners will complete a diverse set of online 8-week classes in financial accounting, taxation and auditing to learn about the field from a global perspective. Full-time online learners can complete the 30-credit degree program in 2 years. The business school also aids online students with their post-graduation job search and helps them find the best employment for their career goals. Applicants must have a bachelor's degree from a regionally accredited college or university with a 2.25 GPA or higher. The GMAT is not required for applicants with a 3.0 GPA or higher. Incoming students who have not completed foundational undergraduate courses in business may have to complete 9 credits of prerequisite courses before moving on to upper-level master's courses. The online Master of Accounting degree at the University of Alabama at Birmingham caters both to applicants with an undergraduate degree in accounting or business and those with a different academic background seeking to enter the accounting field. Whether you have been working in the field since your undergraduate graduation, or you are coming from a different career or degree program, UAB's fully online program is set up to help you to gain the knowledge and skills needed to enter a career in auditing, accounting or management and to take the CPA exam. The program's award-winning faculty has experience in the industry and offers networking opportunities for students. Those without an accounting or business undergraduate degree will need to enter a bridge program, which includes 24 credits of coursework covering the principles of accounting, financial accounting and foundations of income taxation. The master's degree program itself involves completion of a total of 30 credits, which can be completed in as few as 5 semesters. Coursework includes 21 credits of core courses in business law, governmental and not-for-profit accounting, advanced financial accounting, corporate governance and tax entities, and up to 9 elective credits. The online program offers 24/7 technical support. You may transfer credits toward this master's degree but all potential credits must be discussed with a UAB academic advisor. Applicants with a bachelor's degree in accounting do not need to submit GMAT scores for admission. The program is accredited by the Association to Advance Collegiate Schools of Business (AACSB). Keystone College's Master In Accountancy (MAcc) degree program was established in 2015. It is a 30-credit program designed to prepare students to sit for the Certified Public Accountant (CPA) exam while expanding their knowledge and skills in a variety of accounting-related subjects, including taxation, auditing, risk management and ethical practices. Classes are presented on a 7-week schedule. Students are expected to complete 2 courses per 7-week period, allowing them to finish their studies in 1 year. They must also complete a graduate thesis. Course subjects offered include advanced auditing, forensic accounting, corporate and partnership taxation, and government and fund accounting. The curriculum also includes 2 CPA exam prep courses. All coursework can be accessed asynchronously and completed fully online. Faculty and technical support services are available to all online students. Students must possess a bachelor's degree from an accredited college or university with an overall GPA of 3.0 or higher to be admitted to the MAcc program. The bachelor's degree can be in any major. However, an applicant whose degree is not in accounting or finance must complete certain prerequisite undergraduate courses in order to be accepted into the program. Applicants must also pass the GMAT exam with a minimum score of 450 points (waived for students with an undergraduate GPA of 3.4 or higher), and submit a current CV and official transcripts from all colleges and universities previously attended. International applicants must submit a Financial Statement (ISFS) with affidavit of ability to pay, and a test score for either the TOEFL (minimum score of 80) or IELTS (minimum score of 6.5). Davenport University's fully online Master of Accountancy (MAcc) degree features a wide range of specialization options and tracks designed to allow students to concentrate their studies in the area of accounting best suited to their career interests and professional goals. Four specializations are available to Davenport MAcc students: Finance, Fraud Examiner and Auditing, Managerial Accountant and Professional Accountant. The program also offers multiple tracks culminating in the student taking Certified Public Accountant (CPA), Certified Management Accountant (CMA), Certified Fraud Examiner (CFE), or Certified Internal Auditor (CIA) examination preparation courses. Earning the MAcc degree also prepares students to sit for the Certified Financial Manager (CFE) and Certified Government Financial Manager (CGFM) exams. Candidates for admission into the MAcc program must possess a bachelor's degree in accounting or finance from a regionally accredited college or university (or approved international institution) with an overall GPA of 2.8 or higher. Applicants must also submit: a current CV or resume with information on education, work experience and community service; a comprehensive 500-word minimum Statement of Purpose explaining why the applicant wishes to pursue the degree; and a signed professional letter of recommendation. Additionally, candidates may be required to successfully complete foundational accounting-related coursework relating to their chosen MAcc track prior to acceptance into the degree program. To earn the Davenport MAcc degree, students must complete 30 semester credit hours of coursework, including 15 credits in core courses and 15 credits in the student's chosen area of specialization. Students currently holding a CPA license, or CFE, CIA or CMA certification, may be able to apply that credit to the corresponding specialization. Shorter University is a private, Christian-affiliated institution offering a wide range of distance learning programs to working professionals and others. The Master of Accountancy (MAcc) degree offered by Shorter University can be earned 100% online in as little as 12 months. The degree provides graduates with the 150 semester hours required to sit for the Certified Public Accountant (CPA) in most states, and further prepares them for professional careers in all sectors of the accounting field. To be accepted into the program, a student must possess a bachelor's degree in either accounting or another discipline, earned with a cumulative GPA of 2.75 or higher. A GMAT with a minimum score of 450 points is also required. Students holding a non-accounting bachelor's degree must complete prerequisite coursework (in financial accounting, managerial accounting, intermediate accounting, auditing and statistics) prior to entering the MAcc program. To earn their degree, students must complete a minimum 31 semester credit hours in core and elective courses in subjects such as advanced financial accounting, internal auditing and fraud, business analytics and research methods, and legal/ethical issues for accounting. Each course must be completed with a C grade or higher, and with a minimum overall 3.0 GPA for all coursework. An in-person internship is not required, although one is offered as an elective course. Program courses are presented in a shortened 8-week format. Shorter University is a military-friendly institution offering a 20% tuition discount for online classes to active-duty personnel and veterans of all branches of the armed services. This discounted rate is not applicable to students simultaneously receiving other military benefits, however. Shorter University is accredited by the Commission on Colleges of the Southern Association of Colleges and Schools (SACS), but there is no specific accreditation for the MAcc program. UMassAmherst's online Master of Science in Accounting degree program offers students an opportunity to fast-track their graduate education at a highly respected university. Graduates are prepared to take on positions in accounting, auditing and budgeting, as well as to continue their educations to earn an MBA or doctorate degree. The program provides students with the educational components needed to sit for the Certified Public Accountant (CPA) exam in most states. To earn this degree, students must complete a minimum of 30 credit hours of coursework consisting of 6 required core classes and 4 elective classes in subjects such as taxes and business decisions, financial statement analysis, forensic accounting and advanced audit. The degree is offered in 2 distance learning formats: hybrid (combination of online and on-campus classes) and fully online. Both formats allow students to complete their studies in as little as 2 semesters. However, students with work and/or family obligations may take longer to complete their degree. To be admitted into the MS in Accounting program, the applicant must possess an undergraduate degree with a minimum 2.75 GPA. The program is designed primarily for students who have recently completed their undergraduate degree in accounting, but accepts candidates with non-accounting and non-business bachelor degrees as well. The school's Accounting Transitions Program offers a set of prerequisite classes that non-accounting degree holders must complete before acceptance into the degree program. Applicants must also submit a test score for either the GMAT or GRE exam (GMAT preferred). Acceptance is determined by an evaluation of several factors, including the candidate's academic history, GMAT/GRE exam results, professional experience, evidence of motivation, and aptitude for graduate-level work. The University of Texas Dallas Online Master of Science in Accounting is designed to provide students with the professional and technical skills necessary to succeed in accounting careers throughout both the public and private sectors, and to prepare them to obtain their CPA license and other important certifications. To earn a degree, a student must complete a minimum of 36 semester credit hours consisting of 21 hours of core degree courses and 15 hours of elective courses. The degree can be completed 100% online study, but online course selection is limited in both subject and term availability, so students must plan their curriculum carefully. Additionally, students intending to sit for the Certified Public Accountant (CPA) exam in Texas are cautioned that the Texas State Board of Public Accountancy requires that 15 of the 30 total hours needed to sit for the CPA exam must be completed through on-campus coursework. Students residing outside of Texas are strongly advised to carefully review their own state's CPA licensure requirements before enrolling. The MS in Accounting program at UT Texas Dallas is open to students holding a bachelor's degree from a properly accredited institution across all major fields of study. Students without an accounting background, however, may be required to complete prerequisite courses in one or more subjects (financial accounting, cost accounting, calculus) at the graduate level. Acceptance into the program is determined by an admissions committee through an assessment of the applicant's qualifications by way of a review of several factors and submitted documentation, including undergraduate GPA, GMAT or GRE exam score, resume, prior work experience, letter of recommendation, and a personal objectives statement. Support services for online students, including video tutorials, live chat, and 24/7 telephone assistance, are available through UT Dallas's eLearning Helpdesk hub webpage. National University, a nonprofit, veteran-founded institution, offers its Master of Accountancy degree in a fully online format designed for students with little or no previous background in accounting. The program is largely based on the content covered in the Uniform CPA exam and prepares graduates for entry into a range of accounting-related careers, such as public or corporate accounting, internal auditing and accounting for government agencies. It's available to anyone holding an undergraduate degree in any discipline, but isn't appropriate for students with an undergraduate degree in accounting. To earn NU's Master of Accountancy, the student must complete a minimum of 63 quarter units of graduate-level coursework. One specialization option is offered in Accounting Professional Skills. Students who choose this specialization must complete an additional 18 quarter units from a group of courses specific to the specialization, as well as a capstone course in which they apply the skills and knowledge learned to a real-life accounting issue. An internship can be substituted for one of the specialization courses. Admission to this degree program is determined by an assessment of a variety of factors, including the applicant's prior academic record, test scores, interviews, professional experience, and educational objectives. Applicants must have earned a bachelor's degree with a GPA of 2.5 overall or 2.75 for the last 90 quarter units completed. Applicants with an undergraduate GPA of 2.0 to 2.49 may be admitted with a satisfactory score on the GMAT, GRE, Miller Analogies Test, or an approved standardized program-specific exam. Students with an undergraduate GPA of 2.0 to 2.49 but without a satisfactory exam score may also be accepted on a probationary basis, but must earn a cumulative GPA of 3.0 for 4.5 to 13.5 quarter units before obtaining full admission. As a military-friendly university and Yellow Ribbon school, NU offers a substantial tuition discount to current active-duty military personnel and their dependents, and accepts the post 9/11 GI Bill, resulting in active-duty and veteran students paying virtually no out-of-pocket costs for their educations. This degree program is accredited by the International Assembly for Collegiate Business Education (IACBE). Florida Atlantic University's Executive Master of Accounting degree programs are tailored with the working professional in mind to provide the knowledge and skills necessary to help graduates succeed in the accounting practice specializations of their choice. There are 5 degree concentrations to choose from: Forensic Accounting, Digital Accounting Forensics and Data Analytics, Professional Accounting, Taxation, and Business Valuation. All programs are offered fully online and designed to be completed in 2 years. Students have the option of completing their coursework asynchronously or by interactive live web video of Saturday morning lectures presented on the school's Fort Lauderdale campus. Online students may also attend Saturday lectures in person if they prefer. Support services for online students include comprehensive academic and 24/7 IT technical assistance. Students must complete a minimum of 30 credits to earn their degree, with at least half of the credits from courses designated on the 6000 level or above. Half of all credits must also be from courses in the student's field of concentration. A minimum 3.0 cumulative GPA must be maintained throughout the course of study. To be considered for admission to any of the 5 Executive Master of Accounting concentrations, candidates must possess a bachelor's degree from a regionally accredited college or university (or international equivalent) with a "competitive" GPA on all previous college work (emphasis on the last 60 credits earned). Admission is open to students of all educational backgrounds. However, students without an accounting bachelor's degree may be required to take foundation courses. Supplemental materials may be required by the Admissions Committee, including documentation of work experience, a writing sample, resume, letters of recommendation, and a competitive GMAT, GRE, or LSAT test score attained within 5 years of application for the degree program. Applications for admission are accepted year-round and students can begin their studies in the spring, summer or fall. 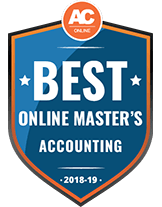 Auburn University's online Master of Accountancy (MAcc) program is designed to prepare students to pass the Uniform Certified Public Account (CPA) exam and to provide working professionals with additional technical, research and communications skills to enhance their careers in accountancy. The program combines traditional instruction methods with online delivery to provide coursework virtually identical to Auburn's on-campus MAcc counterpart. On-campus classes are offered to online students to view either live or at a time of their convenience. Exams are taken remotely and administered by an exam proctor approved by Auburn, such as a work supervisor or local librarian. Students communicate with teachers via email, phone calls, Skype and discussion boards. There is an academic advisor to counsel online students on course registration and educational goals. All coursework is completed online with the exception of one 3-day on-campus residency presented in the student's final spring semester. To graduate, students must complete 30 semester hours of coursework, 21 hours of which must be graduate-level accounting courses. Auburn's MAcc is a non-thesis degree program. Working students can complete the degree in as little as 2 years (five semesters, 2 classes per semester) while non-working students can complete all coursework in as little as 1 year (three semesters). To be admitted to the program, an applicant must possess a bachelor's degree from a regionally accredited U.S. institution and be a U.S. citizen or Green cardholder, as well as meet several other accounting (intermediate accounting, auditing, income tax, etc.) and business (microeconomics, macroeconomics, statistics, business law, etc.) foundation prerequisites. A student's undergraduate GPA, GMAT score, academic background, work experience and letters or recommendation may be taken into consideration during the admissions process. Minimum GPA and GMAT scores are not advertised, but are considered as part of the program's "holistic approach" to admission determination. Auburn University is accredited by the Southern Association of Colleges and Schools (SACS) and the School of Accountancy is accredited by the Association to Advance Collegiate Schools of Business (AACSB). Bellevue University's fully online Master of Science in Accounting degree is intended to prepare graduates for careers as professional accountants in a range of environments, including financial institutions, public practice, industry, government and nonprofit organizations. Additionally, all completed coursework is applicable to the 150-credit hour requirement to sit for the Certified Public Accountant (CPA) exam. However, students intending to apply for a professional license or certification are responsible for determining whether this degree program meets licensure and certification requirements in their jurisdictions. Bellevue University is accredited by the Higher Learning Commission. There is currently no program-specific accreditation for the Master of Science in Accounting program. To earn this degree, students must complete 36 credit hours of coursework. Students have the option of adding concentrations in Finance and/or Tax. Each requires completion of an additional 9 credit hours of related coursework. Through Bellevue's Cyber-Active Online Classroom, students can attend class on their own schedule, discuss lessons with instructors, meet and interact with fellow students, conduct research at the online library, and access other support services such as the Writing Center and the Tutoring and Study Skills Center. Admissions requirements include a bachelor's or master's degree from a regionally accredited college or university (or U.S. equivalent from a nationally or internationally accredited institution) with a minimum 2.5 GPA for the most recent 60 hours of bachelor degree coursework (or 3.0 GPA for previous graduate-level coursework). Applicants may also be required to submit letters of recommendation and/or be interviewed by the Admissions and Standards Committee prior to the final admission decision. Acceptance into the program is done on an ongoing basis, and students can begin their courses of study at one of several starting points offered throughout the year. Western Governor University's Master of Science in Accounting is a 100% online degree program designed to help students become more seasoned accounting professionals, thus allowing them to pursue a greater range of employment positions in both the public and private accounting sectors. The program also provides students the 150 semester hours needed to sit for the Certified Public Accountant exam and obtain CPA licensure in their state of residence, as well as prepares them to sit for the exams leading to the Certified Management Accountant (CMA) and Certified Internal Auditor (CIA) certifications. WGU's MS in Accounting is delivered in a unique competency-based format in which students pay a flat per-semester tuition that allows them to save money by accelerating their study pace. Study consists of 10 courses in 4 critical topical areas: accounting, management, finance and strategy. Students are expected to complete a minimum of 8 competency units (WGU's credit hour equivalent) during each 6-month term. Each course consists of 3 or 4 units and focuses on a set of defined competencies that the student must learn and demonstrate mastery of through successful completion of assigned projects, papers, tests and other assessments. There are no actual classes to attend. To be admitted to the MS in Accounting program, students must submit a transcript verifying receipt of their bachelor's degree from a recognized and accredited institution, and demonstrate accounting experience in the form of either a bachelor's degree in accounting or a CPA license. Applicants then interview with an enrollment counselor who assesses their prior education, experience and career goals to determine if they are a good fit for the program. This degree program is accredited by the Accreditation Council for Business Schools and Programs (ACBSP). Southern Utah University offers a Master of Accountancy that can be completed entirely online. This degree was developed to help students satisfy Utah's requirement of 150 hours to sit for the CPA exam. It prepares students to use quantitative analysis and information technology to support decision-making, effectively communicate information relevant to accounting, develop resolve to have moral courage in accounting, and gain the knowledge and skills necessary to pursue a career in accounting. For admission into the Master of Accountancy program, students must take the GMAT or GRE and hold a bachelor's degree in a business-related field from an accredited institution with a minimum GPA of 3.0. Those with a bachelor's degree from an AACSB accredited business program and who hold a GPA of at least 3.7 are not required to submit GMAT or GRE scores. Students who enroll in this program may specialize in managerial accounting, public accounting or taxation. This 30-credit hour program involves 4 core courses: Business Law II, Auditing II, Practice and Theory Seminar, and Accounting Ethics Seminar. Electives such as Estate and Gift Taxes, Forensic Accounting, Negotiation and Conflict Resolution, Property Transactions and Corporate Tax I are also part of the curriculum. In order to graduate, students are required to complete this program within 6 years and maintain a cumulative GPA of 3.0 in all courses. Individuals who graduate with a Master of Accountancy from Southern Utah University are often found working in accounting firms or government agencies in positions related to taxation, auditing and controllership. Mid-America Christian University allows students to earn an online Master of Business Administration in Accounting. This program emphasizes a student's professional skills while giving them the opportunity to focus on strategies that specifically relate to accounting. It is geared toward today's rapidly changing business environment and is integrated with practical application of biblical principles and Christian values. Students seeking admission into this program must hold a bachelor's degree in accounting with a minimum GPA of 2.75 and a minimum TOEFL score of 550. Students who do not have a bachelor's degree in accounting but would like to earn the Master of Business Administration in Accounting are required to take several prerequisites, including Intermediate Accounting II, Income Tax Accounting I, Advanced Financial Accounting or equivalent, and Auditing. Upon completion of the program, students will gain a mastery of financial accounting, accounting information systems, business taxation and auditing. They will also learn how to lead new and expanding enterprises, businesses and organizations. The online courses in the Master of Business Administration in Accounting are 100% online and require students take them one at a time in specified sequence. In most cases, students can complete this 48-credit hour degree in 2 years while maintaining their job and/or family life. Required courses include classes such as Advanced Cost Accounting, Business Taxation, Managerial Economics in a Globalized Environment, Marketing Analysis and Strategy, and Human Resource Management. Veterans and students in the military can also take advantage of Mid-America Christian University's tuition benefits. At the University of Illinois at Urbana-Champaign, prospective students may earn an online Master of Science in Accountancy, or iMSA. For acceptance into the iMSA program, students must hold an undergraduate GPA of at least 3.0 and submit GMAT or GRE scores. Applicants whose native language is not English are required to take the Test of English as a Foreign Language, or TOEFL. This online degree is delivered through Coursera, an online learning program that allows for a heavily practice-oriented and hands-on experience. Its courses are interactive and allow professors to personally engage with students while promoting classmate collaboration. The iMSA is designed to prepare and enable students to build their expertise in the fundamentals of accounting, which are financial reporting, audit and control, and taxation. This 32-credit hour graduate program can be completed in 4 semesters, totaling 18 months, or up to 8 semesters, totaling 36 months. Core iMSA courses include Accounting Analysis I, Accounting Analysis II, Managerial Accounting, Auditing and Federal taxation. Advanced Financial Reporting, Principles of Business Law, Digital Marketing Analytics and Global Strategy are several examples of the available electives. Students who wish to acquire specific skills, enhance their knowledge in a specific area or require additional credits to sit for the CPA can complete iMSA courses without applying to the full degree program. In addition, students can access and complete the self-directed, non-credit component of iMSA courses on their own schedule, several times a year. iMSA students receive the opportunity to attend special meet-ups around the word, join alumni events in their local area and visit the University of Illinoi at Urbana-Champaign campus any time they wish. George Mason University offers a part-time, online Master of Science in Accounting, which is accredited by AACSB International. This degree was developed for students who are searching for scheduling flexibility and working professionals who hope to continue their career while attending graduate school. For admission into the program, students must hold an undergraduate degree in accounting, business or an equivalent major from an accredited institution and submit GMAT or GRE scores, a resume and 2 letters of recommendation. Students who enroll in this Master of Science in Accounting program can prepare themselves for a career in global accounting, to further their knowledge in the areas of business ethics and corporate governance and to meet the 150-credit requirement to sit for the CPA exam. George Mason University students who earn a Master of Science in Accounting receive an average starting salary of $10,738 more than students who only earn a Bachelor of Science in Accounting. Those who enroll in this 30-credit hour program take 15 credits of required courses and 15 credits of elective courses. Required courses include Professional Accounting Colloquium, Identifying and Resolving Advanced Issues in Taxation, Identifying and Resolving Advanced Issues in Financial Accounting, Fraud Examination and Global Accounting Environment. Taxes and Business Strategy, Fraud and the Law, and Federal Financial Reporting are several examples of the electives that students may take. Students who graduate with a Master of Science in Accounting and pass the CPA exam have greater accounting career opportunities and earning potential. CPAs may advance to positions such as controller, chief financial officer and chief operating officer. The University of Maryland University College, a not-for-profit institution serving over 90,000 students, has a robust offering of online degrees through its State University Global Campus. You can earn your Master of Science in Accounting and Financial Management degree 100% online. You will study with certified public accountants and engage with a rigorous curriculum to move toward careers in leadership positions such as chief financial officer. Students seeking careers as accountants, financial managers and other mid-level positions will gain the essential knowledge and competencies in this program. As a master's degree students, you will work on projects with real companies and organizations, learn how to handle financial emergencies and analyze complex sets of data. UMUC faculty work with a board of industry leaders and employers to ensure your curriculum and training covers emerging areas in the field and will help you advance your career. You must complete a total of 36 credits for graduation. Students may transfer a total of 6 credits from another institution provided they earned them within the last 5 years. Incoming students should have a background in finance or accounting and familiarity with relevant software such as Microsoft Excel. Applicants must have completed at least 15 undergraduate credits in accounting. Students with less than 15 accounting credits may be accepted, but they must complete the remedial credits as soon as possible in tandem with the required finance courses. Active military, veterans, their spouses and dependants pay the in-state tuition rate. This degree also prepares you to sit for the Certified Public Accountant exam, but students must make sure that they meet the requisite number of accounting credits for their state. In Maryland, a candidate must have completed 120 credits toward an accounting degree. The GRE or GMAT is not required for admission. At the University of Connecticut, students can earn an online Master of Science in Accounting. This program focuses on issues relevant to today's accounting professional rather than traditional course offerings, which typically rely on the content and structure of textbooks. In order to provide students with the information they need to be competitive and successful in the accounting industry, each online course has been tailored to further students' accounting education and skillset. While an undergraduate degree and GMAT scores are required for admission into this degree program, students don't have to hold an undergraduate degree in accounting. If their degree is another field of study, however, they must complete 7 prerequisite courses, including Introductory Financial Accounting, Introductory Managerial Accounting, Intermediate Financial Accounting I and II, Cost Accounting, U.S. Federal Income Tax and Auditing. Candidates should also demonstrate a desire to learn, have strong communication skills, be self-motivated and comfortable working independently or in groups, and perform well under tight deadlines. The University of Connecticut's online Master of Science in Accounting begins one time per year, typically in the third week of May, and involves a 4-day in-residence class at the Storrs campus. This 30-credit hour program consists of core courses, such as Contemporary Issues in Financial Reporting, and requires the completion of 8 elective courses, covering content areas such as advanced assurance services, taxes and business strategy, research for accounting professionals and evaluating internal controls. Students have the option to take classes full time, completing 10 courses over 2-3 semesters, or part-time, spreading the 10 courses over multiple semesters. Colorado State University-Global Campus offers an online Master of Professional Accounting. This 30-credit program is for students interested in pursuing careers as Certified Professional Accountants. Students learn how to stay up-to-date with financial laws and regulations that are critical to their success in the accounting field. The CSU-Global curriculum focuses on developing leadership, teamwork, planning and communication skills. Graduates often work independently, helping businesses and organizations operate more efficiently and, ultimately, increase their profits. CSU-Global students are also prepared for roles in public accounting with corporations, government agencies and other financially related fields. In addition to meeting institutional graduate admission standards, students pursuing admission to the Master of Professional Accounting program should have an undergraduate degree with a major or concentration in accounting. Those without this requirement may still seek admission to the program with coordinator approval, provided applicants have previous accounting experience and either 15 hours of upper-division accounting coursework or an MBA with 12 hours of accounting coursework. For full admission to the program, students must complete the first 6 introductory classes within 12 months of starting and maintain a 3.0 GPA. Required courses include Accounting Ethics, International Accounting, Forensic Accounting and Advanced Cost Accounting. Students must also complete a capstone project and an optional but recommended accounting internship. Prospective students' applications must include a resume and a statement of purpose that outlines their plans for academic achievement and reasons for wanting to enroll at CSU-Global. This school also requires applicants to take the online SmarterMeasure Assessment as part of the application process. The University of Massachusetts Lowell is a public research Institution established in 1894. With more than 18,000 students, it is the 2nd largest public institution in the state. 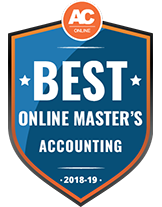 Through the Manning School of Business, UMass Lowell offers the online Master of Science in Accounting, with flexible courses and part-time enrollment available. As part of the Division of Online and Continuing Education program, this degree helps qualified adult students prepare for higher-level accounting positions while managing a busy schedule. The curriculum includes topics such advanced auditing, corporate finance, forensic accounting, globalization and government and nonprofit accounting. All required courses for the degree may be completed online. Incoming students without undergraduate degrees in accounting may have to take prerequisite courses including Intermediate Accounting 1 and 2, Cost Accounting, Auditing, Federal Income Taxes and Financial and Managerial Accounting. Required major courses in this program include Advanced Management and Sustainability Accounting, Contemporary Accounting Issues, Financial Accounting Theory and Research and Taxation of Business Entities. Applications for this graduate program should include official undergraduate transcripts, GMAT or GRE test score results, 3 letters of recommendation from previous employment or academic sources, a current resume and 1-page essay highlighting the applicant's academic and career goals. Online students at UMass Lowell have access to several student resources, including tutoring services, personalized career development and job search assistance through the Office of Career Services and Cooperative Education Center. In addition, students gain expertise in the legal, ethical and business tenets that accountants are expected to adhere to throughout their careers. What’s the difference between a master’s in accounting and an MBA in accounting? While both a master’s in accounting and an MBA in accounting help students sharpen their skills to move up the career ladder, there are fundamental differences between the two programs. Those who enroll in an MBA in accounting take in-depth business courses, which allow them to gain skills that can be applied to many careers, while taking accounting classes that are more fundamental in nature. Accounting master’s students receive an exhaustive accounting education that gives them a thorough understanding of theories and practices, as well as expertise in a specific subsection of the accounting discipline. What common courses are offered in a master’s in accounting program? Although the specific curriculum differs from school to school, generally students who enroll in a master’s in accounting program complete the following coursework. This class provides students with an understanding of financial statement interpretation, liability accounts, pension plans, income tax allocation and revenues and expenses. This class covers the unique accounting issues that arise in governmental settings on the local, state and federal levels. Students may learn how accountants work with government clients in terms of budgeting, financial statement preparation and auditing. Income tax courses cover how taxation should be handled in different settings, from the individual who is filing their annual taxes to the corporation that has several business investments. Specific topics addressed in the class may include liquidation of assets, gifts, standard deductions and tax research. Students who want to work at multinational corporations can take an international accounting class in order to learn the financial regulations of different countries. The course may cover financial reporting standards, taxation and portfolio management. Organizational leaders make vital decisions that impact the entire company, and accountants play an important role in how those decisions are made. Managerial accounting classes prepare professionals for this important position by teaching students how to measure a company’s performance, review pricing and do accurate business forecasting. The exams and projects that students in graduate accounting programs are expected to complete depend on what their specific program requires. In some programs, students are required to pass a comprehensive exam to demonstrate their understanding of the curriculum, particularly in the students’ area of concentration. In other programs, students are required to complete a master’s thesis, which examines a specific accounting topic under the supervision of a graduate advisor. Students may also have to complete a research project, which entails assisting a professor with an original study. There are also programs that may require a combination of these activities in order to determine the competency of its students. What specializations are available in a master’s in accounting program? One of the benefits of enrolling in a master’s in accounting program is the ability for students to get a comprehensive understanding of a specific area of the field. The following are some of the concentrations that can be found in accounting programs. Whether students are interested in becoming government auditors or in-house auditors at private companies, this specialization provides the tools they need. Students who enroll in this concentration take courses on control issues, cash-flow estimation, and capital budgeting. Forensic accountants are charged with investigating financial transactions to determine if a crime has been committed. Students in this specialization take classes that cover how to detect money laundering, assist with the computer discovery process, create reports about the findings of an investigation, and testify in court. Professionals can choose this concentration to train for a career at government agencies, as well as nonprofit organizations. People learn how to create, implement, and maintain accounting information systems within this professional environment. This specialization prepares students to apply accounting concepts on a global scale. Coursework may address international trade laws, accounting principles and procedures used in foreign countries, and setting up company subsidiaries overseas. Accountants who want to specialize in taxation muse have a deep understanding of how income is taxed on a federal, state, and local level. Students who pursue this concentration study the Internal Revenue Code, international taxation methods, treasury regulations, and gift taxes. Although all accountants work with numbers, there are different areas of the field where professionals can apply their knowledge of industry principles. The following are some of the careers that accountants can pursue. Organizations hire internal auditors to ensure their financial records are complete and in order. The job duties of auditors include organizing and maintaining the books of a company, compiling information that can be used in annual reports, detecting internal fraud within and organization, and recommending how companies can improve their financial operations. External auditors, on the other hand, examine the finances of an organization on behalf of the government to find out if there are fraudulent activities taking place. Certified public accountants work with individuals and organizations to help them meet their financial goals. Although much of the work that these professionals perform on behalf of their clients is related to taxes, CPAs also provide advice on other financial matters, such as retirement planning. Specific duties of these professionals include preparing financial reports, organizing and maintaining financial records, advising clients on how to reduce costs, and staying up-to-date on industry trends. When people commit financial fraud, they leave behind clues that can be uncovered by forensic accountants. These professionals reconstruct destroyed financial records, analyze financial evidence, draft reports about investigation findings, and assist with legal proceedings. Forensic accountants may use their expertise to assist the government with white collar crime cases involving embezzlement, securities fraud, and bankruptcy. They may also work on civil matters, like divorces. Management accountants help companies maintain their financial fitness by helping them with budgeting, risk management, and transaction monitoring. Also, these professionals make forecasts about what will happen in a company’s financial future based on their current and past activities. A project accountant is responsible for managing the financial aspects of a specific project within an organization. These workers maintain project records, review and approve invoices from suppliers, create budgets, and ensure a project complies with applicable regulations. They may work on a product launch or a construction project, for example. As accountants grow in their careers, it’s important for them to keep abreast of changes in the industry. One way they can do this is by becoming active in professional organizations, which also allow them to network with their peers. The following are examples of organizations that accountants can join. Certified public accountants who join this organization can participate in webcasts, meetings, and conferences. Members can also take advantage of tools to help them with their daily practice, a career center, and discounts on business services. In addition, the organization acts as a voice for accounting professionals by communicating the needs of the industry to lawmakers. This association provides anti-fraud training and education to professionals around the globe. In addition to offering certifications, the organization has career support services, networking events, and seminars. This organization has focused on the needs of management accounting professionals since it was founded in 1919. With 300 chapters in 140 countries, the association focuses on strengthening the careers of members around the world by providing certifications, continuing education, career management tools, and professional publications. Since 1945, this organization has been dedicated to helping accountants by promoting education and high ethical standards within the industry. It offers webinars, exam preparation courses, continuing education, and publications that provide accounting news and tips for managing a practice. Also, the group organizes an annual convention where accountants can get leadership training, network with other professionals, and take seminars featuring the latest industry information. This organization is dedicated to providing industry research, professional development, advocacy services, and certification programs. The association covers topics such as cybersecurity, leadership development, artificial intelligence, and financial risk. According to the U.S. Bureau of Labor Statistics, the employment outlook for people in the accounting field is going to grow faster than the average overall job growth rate. Between 2016 and 2026, accountants will on average experience ten percent growth in job opportunities. This is because of several factors, including the increased need for companies to get the advice and analysis of accountants as they automate tasks like data entry. In addition, growth in the overall economy will increase the demand for accountants to prepare and review financial records. Other changes in organizations will also impact the number of jobs for accountants. For example, as more companies go public, these professionals will be required to prepare their financial documentation. In addition, companies that decide to increase their global presence will require accountants to advise them on how to handle international trade and mergers. Not only do master’s programs in accounting help to prepare students for the advanced work and specializations professionals will need to keep up with the growth trends, they also increase their earning potential. The Center on Education and the Workforce reports that accountants who have a bachelor’s degree make a median income of $69,000, compared to $91,000 for those with a graduate degree. In order to ensure that master’s in accounting programs have quality control, schools undergo the accreditation process, which involves scrutinizing an accounting department’s content, faculty and research. It’s important for students who want to earn accounting graduate degrees to find programs that have been accredited by the Association to Advance Collegiate Schools of Business (AACSB), the International Assembly for Collegiate Business Education (IACBE), or the Accreditation Council for Business Schools and Programs (ACBSP), which are organizations that certify a school’s dedication to providing quality education to its students. Just as they would have done in the undergraduate years, students who enroll in online master’s degrees in accounting can begin their search for financial aid by filling out a Free Application for Federal Student Aid (FAFSA). This helps to determine how much students are eligible to receive in federal loans and grants, as well as whether they can participate in a graduate assistantship at their school—which would allow them to work on research studies or help with teaching undergraduate courses, under the supervision of a professor. In addition, there are scholarships for accounting graduate students provided by professional associations. For example, on the national level, scholarships are available through the Institute of Management Accountants and the Association of International Certified Professional Accountants, and state associations like the Arizona Society of Certified Public Accountants and the Society of Louisiana Certified Public Accountants also provide scholarships.